Even by the end of the last century it was obvious that the indigenous wood supply in New Zealand could not last. It was fortunate there were individuals who expressed this concern to the government. 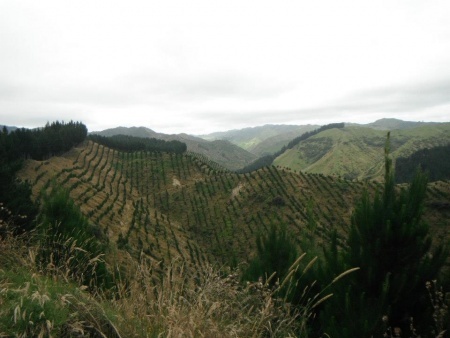 As a result, the government of the day set up a Royal Commission to look at the future of forestry in New Zealand. The commission strongly recommended the planting of exotic forests and as a consequence, the planting of radiata pine began. By 1936 a total of 317,000 hectares of exotic timber had been planted. Today New Zealand has around 1.64million hectares of exotic plantations, approximately 90% of which is planted in radiata pine. These plantations are currently producing approximately 16 million cubic metres of wood per annum. This production is expected to almost treble to more than 40 million cubic metres per annum, with continued replanting, by the year 2020. In New Zealand it takes between 25 to 30 years for Radiata Pine to reach maturity. It would take between 60 and 300 years to reach the same size in most other countries. Radiata pine has a wide variety of end uses including timber, pulp, plywood and panel products and high quality furniture. Towards the end of the century New Zealand’s foreign exchange earnings are expected to rise from $2.2 billion to $3 billion per year. These earnings are in today’s dollars and it is estimated that this will contribute 20% - 25% of the country’s export income. Over the past 60 years New Zealanders have become highly skilled in managing pine forests and with our strong research base and vast knowledge of plantation forestry, we are in a very strong position to supply the international timber markets. Global demand is increasing. Historically the world’s consumption of wood has increased steadily with population growth. The United Nations Food & Agricultural Organisation (FAO) predicts that world roundwood consumption will increase by 50% from the 1991 to over 5,000 million cubic metres annually by the year 2010, taking into account shifts into substitutes such as plastic and steel. A recent study by international forestry consultants Groome-Poyry Limited predicts that net imports of softwood products to the Asia-Pacific Region, excluding New Zealand, will increase from 80 million cubic metres per year roundwood equivalents in 1987 to over 130 million cubic metres per year. This represents a growth in import demand of 60%. The highest growth in demand is forecast for sawn timber and softwood logs. At the same time that demand is increasing, traditional supplies are becoming increasingly restricted, due to depletion of natural resources and environmental restrictions. World forests are being reduced by between 11 million and 20 million hectares each year with continued pressure from a concerned population to preserve remaining natural forests. New Zealand is well placed to meet part of this demand. Through pruning to achieve high quality knot free timber, it is expected that New Zealand's future forest resource will be a much sought after commodity. In other countries with large areas of radiata pine, pruning has generally not taken place and the option of producing knot-free wood from those particular forests is not feasible in the immediate future. Radiata pine’s wide variety of end uses is becoming increasingly recognised internationally. Recent studies carried out by the New Zealand Forest Research Institute in conjunction with overseas research organisations (including University of California, Berkeley) compared the machining properties of New Zealand grown radiata pine with major timbers used in Europe and North America. Over the 25 tests in the study, New Zealand radiata pine scored highest. Compared with other land based investments, forestry has the advantage of being able to be harvested when market conditions are favourable, rather than at a set age or season.